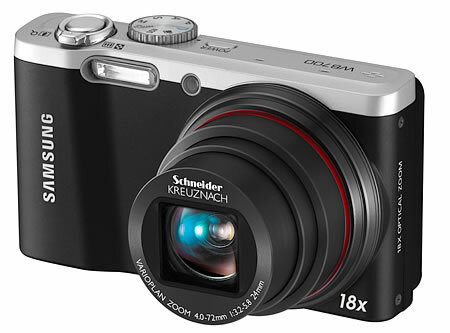 Samsung camera WB700 features a 24mm ultra wide lens from Schneider KREUZNACH to capture a broad picture perfect, and incredible 24X zoom function, consisting of 18X optical zoom and 1.3X Smart Zoom. Samsung digital camera WB700 gives sharp images with incredible detail that rely on 16 Megapixel CCD sensor camera. Samsung Camera WB700 is also equipped with full manual control and the ability to record 720p high definition video in H.264 format. Samsung digital camera WB700 also features a Smart Filter 2.0 - in a mode of artistic filters such as 'soft focus' as 'half-tone dot' and 'cinema' in addition to traditional features such as 'sketches', 'fish-eye', 'miniature' of all providing entertaining and professional finishing touch with a touch of button.